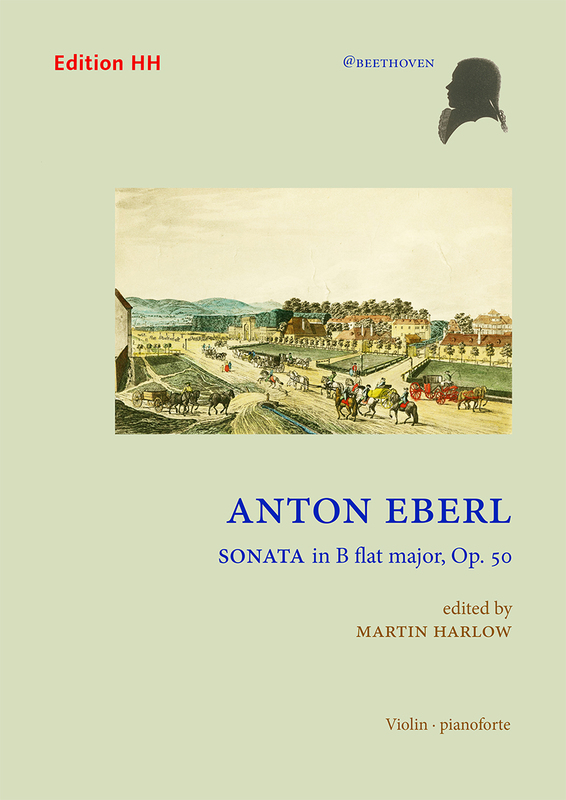 Among Vienna’s many composers and pianists of the time, Anton Eberl (1765–1807) was the one considered most worthy of comparison with Beethoven. His Sonata in B flat major, Op.50, is probably the second of his seven sonatas with violin, and was published posthumously in Vienna the year after his March 1807 death. Surviving correspondence between Eberl’s widow, Maria Anna, and the Leipzig publisher Ambrosius Kühnel permit an accurate dating of the work at 1795. This makes the sonata, and its companion in F major, Op.49 (1792), works of particular interest to modern performers, pre-dating Beethoven’s Op.12 set of three sonatas with violin from 1798. The model for this sonata is Mozart, specifically his Sonata in B flat major, K.454, written in 1784. Eberl borrows many structural and stylistic features from K.454: the grand, slow introduction of the first movement; the song-like second movement opening over rocking accompaniment; and the gavotte-like closing rondo. Eberl even quotes directly from K.454. But the work also looks forward to Beethoven’s contributions to the genre, and in its duration, formal and harmonic novelty, and in the lively relationship between the violin and keyboard, Op.50 shares much of the musical ambition and quality of Beethoven’s early works in this genre.